As part of the first national Oxfam Bookfest, which runs from 4 to 18 July 2009, the British charity will be holding a comics event in Edinburgh. With the Dundee Literary Festival Comics Day in June and the Edinburgh International Book Festival with its anticipated comics talks in August, central Scotland was already well served for comics events this summer so this is an extra bonus. To be held between Noon and 3pm on Saturday 18 July in Edinburgh's McDonald Road Library located at the corner of McDonald Road and Leith Walk, the event is being advertised as a comics workshop covering 2000AD and More. Currently Commando and Spectacular Spiderman writer Ferg Handley is scheduled to appear with more guests due to be announced and attendees will also get the chance to bid on donated items during an auction. This is only one of a number of book related events happening around the country in July organised by Oxfam which is the UK's largest retailer of second hand books. As yet there are no details of ticket prices or further guests . • More details of the Oxfam Comics In Scotland event can be found on the Oxfam UK website. • The locations of Oxfam Bookshops can be found using the Oxfam Shop Locator. With the successful Scottish comics convention Hi-Ex over for this year and already confirmed as going ahead next year, the countdown to the next major Scottish comics event of the year is now in full swing. The third Dundee University Comics Conference, Timeframes, will be taking place in the modern, comfortable and well equipped D'Arcy Thompson Lecture Theatre in the Tower Building of Dundee University on Sunday 28 June as part of the Dundee Literary Festival. While the event is more of a conference than a convention, organiser Dr Chris Murray of the University's English Department has an impressive line-up of guests planned covering a wide range of artists, writers and editors. 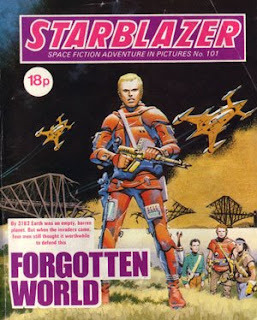 In addition to the presentations, the conference will host the opening of an exhibition in the university's Lamb Gallery featuring DC Thomson's much loved science fiction digest, Starblazer, which follows on from the impressive Beano exhibition held there last year. Starblazer editor Bill McLoughlin and artist Keith Robson will open the exhibition as well as giving a presentation on the title. Among the other presentations during the day, writer and former 2000AD editor David Bishop will remain with the science fiction theme for a presentation on Alan Moore's 2000AD stories, while Manga Shakespeare artist Emma Vieceli will discuss her adaptations of Hamlet and Much Ado About Nothing. Dr Mel Gibson will discuss Alice In Sunderland by last year's keynote speaker, Bryan Talbot, while this year's keynote speakers will be writers Alan Grant and Warren Ellis who will be talking, answering questions and signing their books. Tickets are available in advance from the Dundee Literary Festival website for a very reasonable £10 for the entire day which includes a morning Writing Workshop from David Bishop. The main conference begins at 1pm and is scheduled to last until 7:30pm. Concessions are £5 while those only wishing to attend the morning workshop can do so for £3. There are no hidden booking charges and refreshments will be provided on the day. • Details of the Comics Day are available on the Dundee Literary Festival website. Tickets can be purchased via the Dundee University on-line shop. • Read the downthetubes review of last year's conference. • Read the downthetubes interview with Starblazer editor Bill McLoughlin. • Busy racing between secret locations in an effort to find an internet connection that worked, we missed out on wishing Garen Ewing, creator of The Rainbow Orchid, a happy birthday yesterday (4th June) but there's still time to enter his competition to win a signed and sketched cover proof of the upcoming collection from Egmont UK! The deadline is midnight GMT on Sunday 7 June. See this post on his official web site for details. • Talking of competitions, Garen reports Sarah McIntyre decided to celebrate his "40th of June" birthday celebrations (along with the likes of Jason Cobley, Gosh! Comics, Forbidden Planet, Paul Harrison-Davies and many others by holding her own competition - you have to draw a suitably extravagant moustache on this terrific portrait of Garen she's drawn. See Sarah's blog for details - and again, the deadline is Sunday evening (7 June). 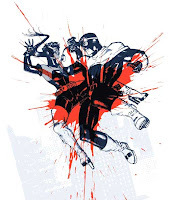 • Lee Robson reports there's a great review of Accent UK's Robots over at Newsarama where it's compared very favourably to the Popgun anthologies from Image Comics. Read the full review here. • And finally... Rob Jackson reports that with the arrival an awesome page for the Pasty Anthology from Jim Medway, his long-awaited collection is almost finished, and hopefully he'll be sending it off to the printers next week. It sounds like a fun assembly of creative talent! If you're in Northern Ireland this weekend, then head along to the 2D Festival at the Verbal Arts Centre in Derry, which is now up and running with guests David Lloyd, Liam Sharp, Glenn Fabry, Mike Collins, Bryan Talbot, David Hine, Garry Leach, Rufus Dayglo, D’ Israeli, Declan Shalvey, Andie Tong, PJ Holden, Nick Roche, Phil Barrett, Bridgeen Gillespie, Andrew Brenner, Cartoon Saloon, Stephen Mooney, Simon Furman and Will Sliney. Learn to draw comics with a host of top comic creators. • Monster Drawing Wall - in association with the Campaign for Drawing (All Day) Draw your own monster on our massive Monster Drawing Wall, spot prizes for the best efforts. • 1.30pm: Like Sherlock Holmes Directed by Quentin Tarantino...With Animals! Get your photo taken with the amazing Emerald Garrison of the Knights of the Empire (Irelands Premier Star Wars Costuming Group). All events are completely FREE of charge. 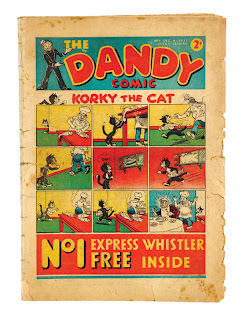 There's still time to bid on items - including a rare copy of the first ever Dandy - from British online auction site Comic Book Auction's Summer Catalogue. Included in the British section of the catalogue is an extremely rare first issue of DC Thomson's humour title, Dandy. Published in 1937, this first edition introduced Korky the Cat, Desperate Dan, Keyhole Kate and their chums and is described as "a well worn copy with 3 inch spine tear and multiple edge tears although only minor loss." Only 20 copies of this first issue are known to exist, so expect some high bids, well above the £500-£600 reserve. Also included this time are some also rare wartime Beanos, all with bright fresh covers and white/off white pages. Since a lot of paper was recycled for the war effort, copies of these issues are probably even rarer than some of the pre-war titles such as Champion, Butterfly, Hotspur and Schoolgirls' Own, which are also being offered. 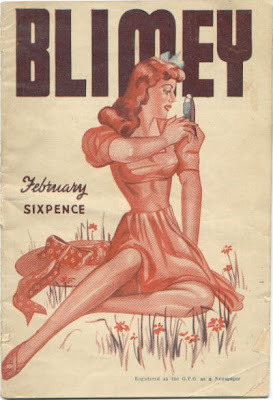 Original Desperate Dan art by Dudley Watkins - a staple of most these regular auctions - is also offered, including work published in a 1942 issue of the Dandy. (Artist Dan paints the town with bristles from his beard. The pictures are so realistic the mayor gets Dan to camouflage all the tanks and planes for battle!). Of interest to many downthetubes readers though will be a page of Ron Embleton art featuring Wulf the Briton from Express Weekly 155 (published in 1957), in which Viking Wulf proves himself to the warrior tribesmen in his quest to solve the riddle of the Sphinx. 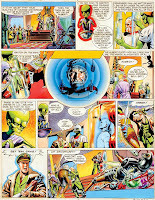 Also beng offered is original Dan Dare art from the Eagle by Desmond Walduck (featuring both Dan and the Mekon), Supercar and Joe 90 art, a Dan Dare space gun, bound copies of Eagle and Lion, issues of TV Century 21 - including several rare and much sought after Specials - Valiant, Tiger and more. For US comics fans, the chance to own the first appearance of Spider-Man in Amazing Fantasy #15 is sure to stir plenty of interest, even if the issue comes stickered with a British 9d tag. A first issue of Amazing Spider-Man is also in the auction, along with plenty of ther goodies including Fantastic Four #1, X-Men #1, Millie the Model, Batman #20 from 1944 - the first Batmobile cover - and lots of other goodies. • Bids on items, which include comics and original art, will be accepted until Tuesday 9 June at 8 PM UK time (GMT). downthetubes is very sorry to report the death of actor David Carradine, star of 1970s cult TV show Kung Fu, whose career saw a huge revival in recent years with an appearance in Quentin Tarrantino's Kill Bill. 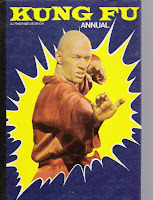 As a teen of the 1970s, though, it is Kung Fu for which he will be best remembered by me. I recall being impressd to learn he took his role as Kwai Chang Caine, the half Asian hero on the run from both Chinese assasins and bounty hunters in the American West so seriously he as known to go barefoot for months to get into the role. The BBC reported earlier today that the 72-year-old actor had been found dead in a Bangkok hotel room, discovered by a hotel maid sitting in a wardrobe with a rope around his neck and body. His personal manager, Chuck Binder, described the news as"shocking", adding: "He was full of life, always wanting to work... a great person." "David Carradine... was a sly, devilish, and at times downright freaky, movie presence who, when he appeared onscreen, automatically made matters twice as interesting," notes Clark Collis for Entertainment Weekly. "Personally, I grew up believing David Carradine to be pretty much the coolest guy in show business, thanks to his starring role in the mayhem-filled Kung Fu. Many years later, I actually had the chance to interview him and found Carradine to be every bit as entertainingly colorful as his reputation would suggest..."
An actor who had appeared in over 200 films, he was known the world over for his work, but less widely known as a musician, composer, author, martial arts expert and visual artist. Among various causes, David was a supporter of Food 4 Africa, an organization committed to working with other organizations to supply children with at least one vitamin and mineral enriched meal for every day. 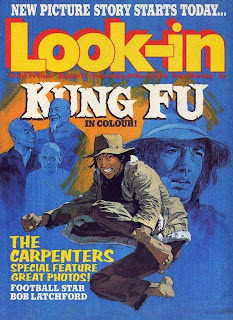 Many downthetubes readers will recall Kung Fu not just as a TV series which ran for three seasons between 1972 and 1975 but as a stunning comic strip in the weekly Junior TV Times, Look-In, drawn largely by Martin Asbury. The strip, like the show, was superb and reprinted in Europe. 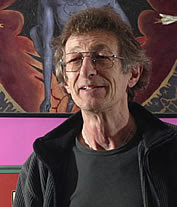 It became Asbury's regular work on the comic after he drew a Follyfoot strip, having previously drawn another TV series-inspired strip, Cannon, for TV Action. Carradine will be much missed, his legacy as the quiet spoken action hero of Kung Fu never forgotten. • David Carradine's biography, Endless Highway, offers a revealing insight into the actor's career. The son of Hollywood royalty, David Carradine amassed more than 200 screen credits in a career that ran from the 1960s to his death at the age of 72. Looking back on his career, he said: "It always seemed to me like a mission. A holy one - like the Blues Brothers." Starting cross cultural comics month on Resonance FM's Strip! 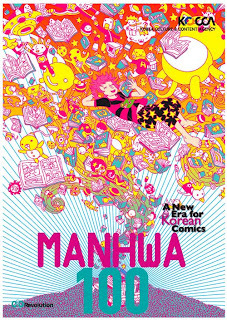 comic show, Dickon Harris introduces the 100 years of Manhwa exhibition at the London Korean Cultural Centre (see our report, here) and talks to a couple of recent illustration graduates this eveing (Thursday 4th June). Alex Fitch also interviews a couple of female indie manga creators – Sally Jane Thompson and Kate Holden – at the Docklands Manga Expo and discusses the brutality of nature with Melody Lee, whose comics depict woodland animals in the style of Beatrix Potter but who also shoot and swear like troopers and are, shall we say, not shy when it comes to under the sheets activity! Sally Jane Thompson is a postgraduate student who grew up in South Africa and was one of the finalists in TokyoPop's 2007 Rising Stars of Manga Contest. "Manga was essentially my first exposure to comics that covered a wider range of genres, and showed me how much scope comics have to communicate!" she said in in an interview back in 2008. "So it’s been a fantastic influence, and I’ve learned a lot through it. 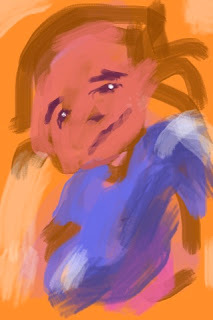 But I wouldn’t class my work as anything more than manga influenced. As manga has become a more prevalent influence over western comics, there is of course lots of debate over what counts as manga and so on, but I think the more varied influences people have, the better, and I’m glad to see the comics world opening up like this." Kate Holden is just one of the team involved in IndieManga.com, a grup of people who crate comics with a manga influence. A "freelance sequential artist" and Designer and MA Video Game Design student, her credits include a webcomic called FanDanGo about magical knights in a retro-punk setting (retro-punk being my word for a 1960’s influenced Fantasy world). 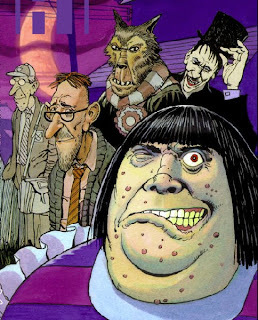 Alan Moore has again mentioned Top Shelf Comix will be publishing new episodes of his quirky story The BoJeffries Saga - a strip which can be likened, perhaps, to The Addams Family or The Munsters in terms of its "monster living on your street" setting. Top British comics artist Steve Parkhouse will again be drawing the strip, as he told downthetubes some time ago, but swore us to secrecy as it had yet to be "officially announced". Alan subsequently mentioned the new stories in Padraig Ó Méalóid's fab interview with Alan for Forbidden Planet International recently, but we didn't pick up on it. More fool us! First published in 1980s title Warrior, additional installments of the Bojeffries Saga, described as a "soap opera of the paranormal" subsequently appeared in US ttile Flesh and Bones before all the Warrior installments were reprinted in colour in Dalgoda. Five new stories then appeared in Atomeka's A1 Anthology (and Swimsuit Special), before the entire series plus some new ones were reprinted in a single volume, Tundra's The Complete Bojeffries Saga in 1984. Two new stories were due to be published in 2005 in A1's Bojeffries Terror Tome #1, but that was never released. 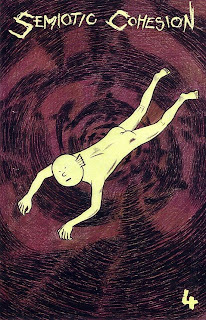 Moore mentioned the new episodes of his surreal title during his talk for the ComicICA Festival on Tuesday night, according to reports on Bleeding Cool and Joel Meadows' Walls and Bridges web sites. Time Capsule: The Origin of "Miracleman"
When Alan Moore and Garry Leach revived Mick Anglo's Marvelman for Warrior back in the 1980s, the treatment proved a spectacular success. But when Eclipse Comics secured the rights to publishing Marvelman in the US, the name of the character ran afoul of litigation from US publisher Marvel Comics, who demanded it be changed. (This unpleasant incident, as you can imagine, caused much acrimony between all parties and led to Alan Moore refusing to ever countenance working for Marvel. For more information on the entire history of Marvelman, visit this page on the World's Greatest Critic site). While the whole matter did nothing to improve US-Anglo comic relations but Eclipse still had to come up with a new name for the character if they wanted to publish the comics in the UK. As J.C. Maçek III notes on his Marvelman page, they decided on "Miracleman" to satisfy Marvel Comics (but still ensure that the "MM" logo didn't have to be changed). Here at downthetubes though, we wonder whether if Eclipse or those advising them knew whether Mick Anglo also created a super-powered character called Miracleman? 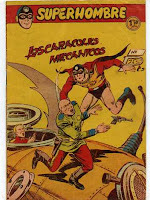 In addition to his work on titles such as Marvelman in the 1950s for Len Miller and Sons, Mick was asked to create a superhero comic for the Spanish market. What he did was to use a similar method he had used when Miller lost the rights to publish DC Comics Captain Marvel in the UK, and adapted (and redrew) some of his Marvelman stories under the name Super Hombre. The character appeared in Editorial Ferma, which ran for 68 issues from 1958. Mick then resold these strips back to the UK, using the name Miracleman. 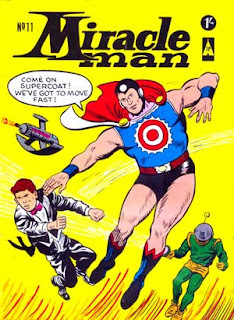 The character was sold through Top Sellers comics and ran for 13 issues beginning in 1965. Top Sellers titles were black and white American comics, running for 60 odd pages and in addition to the Miracleman stories featured reprints of DC Comics Blackhawk. Miracleman was also sold in Germany (see info here) and Holland (where he was known as "Mirakel Man"). Like Marvelman, Miracleman's alter ego, cub reporter John Chapman, became super powered by uttering a special phrase: "Sun Disc", rather than "Kimota". His powers seem more akin to DC Comics Superman than Marvelman however, and also dependent on him actually holding the ancient "sun disc". In one of the issues we've come across -- Miracleman #11 - it seems anyone can become a "Miracleman" by holding the artefact... including villains! Miracleman was also aided in his battles against evil by Supercoat - yes, powers borne of putting on a special coat. Surely one of the oddest superhero names ever? 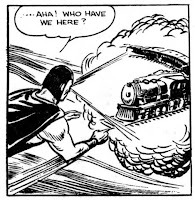 An entertaining gem of British comics history, nonetheless, and one we thought you'd enjoy. • Special thanks to Alan Wright for imagery used in this item. For more information about Marvelman, check out the International Hero web site, or track down a copy of Dennis Gifford's Complete Catalogue of British Comics. After our recent news story about rumours that ComicCon was coming to London's 02 venue next year - a report flatly denied by the organisers of the US San Diego ComicCon who have since stated categorically they had not licensed the brand to anyone for UK use - ace cult site Geek Syndicate has set the story straight with the publication of a press release from 5 by 5 Media (PDF), which offers more information on the upcoming 5 by 5 Festival. The Festival will take place in East London in June and July and is described by 5 by 5 Media's Chief Executive Liam Fisher as a celebration of films, music, art and fashion. The confirmed content will be announced to the public in due course. In an official press release published on the Geek Syndicate site in full, Mr Fisher does not mention any of the rumoured comics guests suggested in recent days, which included Alan Moore - known to avoid conventions these days like the plague - and Stan Lee. As for the rumours of a comics event at the 02 next year which began with a now clearly erroneous story over on ComicRelated, Mr Fisher confirms he does have plans to use the venue "for several events" but makes no mention of any reported connection with the US ComicCon. "I have plans to hold several major pop culture events across Europe and as soon as everything is finalised it will be announced," he states. "I have plans to use the 02 Arena for several events and when these are finalised they will be announced." Commenting on the rumours, Mr Fisher says "I really appreciate the level of interest, excitement, panic and hype already built around an incorrect 'news' story." Resisting the urge to be drawn further on his plans he says anything comics fans may have heard about them "can be dismissed as hearsay and either laughed at and ridiculed, cursed or iglnored depending on what mood you're in. "Keep your ears open and your eyes peeled as all will soon become clear. Trust me, when the time is right, my communication will be nothing less than 5 by 5." We hope to keep you posted on developments as they happen. Our thanks to Barry Nugent at Geek Syndicate for drawing our attention to the release and we're more than happy to hopefully help set matters straight. This is the second of a series of interviews with British comic convention organisers over the next few months, which will be cross-posted on downthetubes, the Forbidden Planet International blog, Bugpowder and Fictions. Our aim is to give the conventions themselves some well-deserved publicity and also to, hopefully, spark a wider debate about what’s good and bad about the convention circuit in the UK. In addition to being co-organiser of BICS, Shane Chebsey has been a leading light in the promotion and distribution of indie comic press titles in the UK for a nuber of years via Smallzone. He hosts several web sites dedicated to the cause of promoting comics of all kinds and print runs, including the Incoming forum (incoming.ning.com), an open community for readers, creators and publishers of small press and independent comics. downthetubes: Please tell us a little about the history of your con/event and how it’s evolved over the years. Shane Chebsey: The first BICS occurred in 2006 at The Custard Factory. Our biggest named guest was Michael Lark of Daredevil fame, and right from the beginning we had wonderful support from the UK scene including publishers and creators. This is something we've always been very grateful for. We just wanted to put on the type of comics show we'd want to attend ourselves, and figured there must be some folks out there who wanted what we did. Since then, BICS has become the largest UK event devoted to the medium of comics, so I guess we weren't alone. Guests have included Mike Mignola, Dave Gibbons, Kevin Nowlan, Michael Golden, John Cassaday, David Lloyd, Alan Davis, Mark Chiarello, Olivier Coipel, Esad Ribic, Adi Granov, Mark Buckingham, plus many, many more top names in the industry. Shane: A combination of table sales, entry fees and our own pockets. Last year we did receive some minor sponsorship and this year we are looking to build on that. We've be also applied for some government funding to help us develop and expand the show, enabling the event to reach out to a wider audience and benefit more people. Shane: We have both short and long term aims and objectives for the show. As well as producing an enjoyable event for existing comic fans, our initial aims with the first three shows was to establish a successful formula for running a comics event in Britain that would be recognised by the UK comics industry including publishers, distributors and retailers, as a major event. This was so that we could build a platform to achieve our main objectives. We have achieved these aims with the first three shows: we attracted over 2500 fans, press, creators and retailers to our last show and most western comics publishers now recognise The British International Comics Show as the major UK comics convention. These include DC Comics, Dark Horse Comics, Rebellion Developments, Markosia Enterprises (who launched new titles at the 2007 show) and Manga Entertainment (who allowed us to show the first official UK screening of one of their new films at the 2007 show) and Random House, who have previously been sponsors of the show. To provide an enjoyable and informative family event to the general public, allowing them to discover new comics and graphic novels they may not have previously encountered. To give new writers and artists access to both publishers and professionals working within the industry both here in the UK and overseas, allowing them the opportunity to receive feedback and advice on their work and to learn more about the international and national industry and about the medium of comics in general. To promote comics to the general public as both an educational and entertainment medium. To provide a secure and fun environment for all comic fans, whatever their cultural, religious or ethnic background, to enjoy the medium, expand their reading and to meet comics creators from all over the world. To give independent and small press creators the chance to promote their publications to the general public and to the larger publishers. To create sufficient revenue to make the show financially self sustaining. To expand the show, attracting even more visitors to the event and to the City of Birmingham. downthetubes: Who is the con aimed at? What sort of punters do you hope to attract? Are you family-friendly? Shane: BICS is very family-friendly and we always aim to attract the full spectrum of attendees, from the young to the old, men, women, everyone! That's the great thing about comics. They are so inclusive almost anyone can enjoy them and create them. Shane: So far we've been very pleased with the varied representation of all groups attending the show. However, we continue to increase our efforts to attract even more diversity amongst our visitors. Shane: This year we are aiming for 3000 people to attend the show over the weekend. Shane: Lots of lessons have been learned. The hardest lesson would be that any expensive advertising must be very targeted to be cost effective. We have also learned not to announce any guests until they are 100% confirmed. We learned this after our very first show. Shane: The web is our most effective method for attracting both visitors and exhibitors to the show. We have an active presence on many forums, a great website, and a very large mailing list that helps us to keep folks informed of developments. We also have our own forum that enables visitors to ask us questions about the show and to share their show experiences with other visitors. Shane: We advertise in many print publications including SFX magazine, 2000AD and TOXIC. We also print up flyers and posters for events etc. Shane: We have great mixture of exhibitors at BICS. This year there will be 162 tables featuring retailers, publishers, art suppliers, creators and distributors. There really is something for everyone. Shane: I have personally done my best to support the small press scene since 1999 when I founded Smallzone [which acts as a distribution service for small press comics]. When I became involved with BICS I was determined to give small press creators a level playing field along with all the big publishers at the show. We offer small press creators a £40 discount from the normal table price to try and make it easier for them to afford being part of the event. We are very proud of the huge diversity of genres and styles on display at BICS, all thanks to the UK small press scene. Shane: Tickets are £12 per day or £20 for the weekend. Children go half price and under 5's go free. We also offer family passes, and free access for carers. We've based these prices on our projected attendance against the cost of our venue and other costs involved in producing the show. When you bear in mind the full program of events happening at the show as well as the comics fair etc., the entry fee is extremely good value for money. How much is a 90-minute football match for all the family these days, or a visit to the cinema for two hours? At those events you don't even get to meet the players or the film stars. At our show you get to meet the stars of comics in a friendly and informal atmosphere. It really is a special opportunity for many fans and we love seeing the faces of young fans when they get their first signed copy of Watchmen or Planetary. Shane: Tables are £160 each for the weekend. We give discounts to small press comic creators and those making multiple table bookings. Again we arrived at this figure based on our costs, and based on the projected takings for the average exhibitor. We have tried very hard to make tables good value for money and provide steady through traffic for all exhibitors at the show. Obviously it's up to the exhibitors to sell or promote their work or products, we can't do that for them. What we do provide is a state of the art venue filled to the brim with comic fans and those who want to find out more about comics. Shane: We have a full program of killer events running all through the weekend of the show. These include exclusive creator interviews, fun quizzes, live art events and professional demos from some of the industry's top creators. We host panel discussions on topical subjects concerning the medium and the industry. We also conduct portfolio reviews for aspiring comics artists. downthetubes: Are there any external events connected to BICS? Educational stuff, talks, workshops, comics promoting, that kind of thing? Shane: We are running an outreach program this year, which involves talks, presentations and workshops in libraries, schools and colleges. We are also presenting an exclusive IMAX Birmingham screening of Watchmen in September hosted by Dave Gibbons, with a signing before the screening. Places will be limited to just 300. More news of this on our website soon. 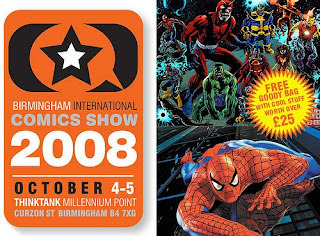 Shane: If you love comics you simply must attend BICS 2009 in October. It's an essential event for every type of fan, whether you love manga, superheroes, small press or even if you're just curious about what comics are. BICS celebrates every form of the medium and is the event to visit in 2009! downthetubes: Thanks, Shane, for answering our questions. • Active Images and ComicCraft First Tiger Richard Starkings has also been answering questions, this time posed by the Den of Geek team. Richard talks about his Elephantmen title, his career at Marvel UK, Doctor Who and much more. A former editor of Doctor Who comics, he's just written a Doctor Who story, Cold Blooded War for IDW, from a plot by Gary Russell, revealing "It's not the kind of story I'd have come up with myself - this one features Ice Warriors, Draconians and even Alpha Centauri - but it was fun writing dialogue for Donna and working out how to pace Gary's outline into 22 pages. Fellow Brit and Whothusiast Adrian Salmon is the artist on this one, and he's done a great job." • James Turner, one of many fine talents who worked on The DFC, has published an all-new Beaver and Steve strip featuring the characters that shot him to deserved national acclaim. "You may not like it," he says, modestly. Silly James - it's beaver and Steve: what's not to like? • The Daily Mail has been having another punt at DJ and chat show host Jonathan Ross, this time ribbing him for his appearance, among other things. "His love of comic books and new-found friendship with Eminem imply that he is slightly immature," Jo Clements opined. Ross recentky revealed he'd given Eminem a copy of Avengers #3 when they'd met. "I knew he needed it. He’s a big Marvel fan," he explained. • Delta and the Bannermen may have been one of the sillier Doctor Who stories of the 1980s (Ken Dodd has a cameo, for one thing), but fans of the sagas comic stories may want to pick up the new DVD release for the bonus features, which include interviews with Lee Sullivan, Simon Furman, Paul Cornell, Andrew Cartmel and John Freeman (who? ), chatting about creating Who for Doctor Who Magazine. (If I look at all bedraggled in the interview it's because I got drenched finding the studio...). The DVD ships on 22nd June. • Talking of Paul Cornell, he's been answering questions from fans of his Captain Britain and MI13 and Dark Reign: Young Avengers titles over on Comic Book Resources, which also has a couple of sneak peeks at the last issue of CB (#15). Talking about the book's cancellation, Paul says "Marvel put loads of effort behind it, an d I got all the support I could wish for. I just think that, in the end, there are certain characters that won't sell well enough in the States. In the UK we were doing very well, but those numbers don't get added into the Diamond sales figures." Hmf! • And finally, since we seem to be on a 1980s reunion theme for this post, my old flat mate and 2000AD editor David Bishop's Doctor Who audio drama Enemy of the Daleks has been getting lots of praise on various fan forums. "I'd written a dozen different projects for Big Finish, so it was a joy to finally get the chance to script a four part story for the main Doctor Who range," he says. You can find out more about Enemy of the Daleks here, even download the first episode for the bargain basement price 99 pence - now that's value! The Manifesto Club, which campaigns against the hyper regulation of everyday life and supports free movement across borders, free expression and free association is co-ordinating a campaign against a new artist visa system introduced by the UK Home Office for organisations that wish to invite non-EU artists and academics to the UK. Campaigners against the new rules argue the proposed regulations will curb invitations to non-EU artists and academics to visit the UK for talks, artist residencies, conferences and temporary exhibitions. This has already seen the cancellation of events and of course could affect any overseas comic creators attending events such as the MCM Expo, the British International Comic Show and other gatherings. "As professionals committed to the principles of internationalism and cultural exchange, we are dismayed by these new regulations," say campaigners. "The system is costly to both the host organisation and to the visitor, and has already meant a number of cancelled exhibitions and concerts." The campaign is led by Manick Govinda, artists' adviser at Artsadmin, and has won support from artists, musicians, gallery directors, academics and students. Together they are calling for the "parochial and suspicious regulations to be reconsidered, and affirm the vital contribution made by global artists and scholars to UK cultural and intellectual life." A petition was launched with a letter in the Observer, signed by high-profile arts figures including artist Antony Gormley, Sandy Nairne, director of the National Portrait Gallery, and Nicholas Hytner, director of the Royal National Theatre. Under the new regulations, all non-EU visitors now must apply for a visa in person, and supply biometric data, electronic fingerprint scans and a digital photograph. The Home Office’s 158-page guideline document also outlines new controls over visitors’ day-to-day activity: visitors must show that they have at least £800 pounds of personal savings, which have been held for at least three months prior to the date of their application; the host organisation must keep copies of the visitor’s passport and their UK Biometric Card, and a history of their contact details. If the visitor does not turn up to their studio or place of work, or their whereabouts is unknown, the organisation is legally obliged to inform the UK Border Agency. "These Home Office restrictions discriminate against our overseas colleagues on the grounds of their nationality and financial resources, and will be particularly detrimental to artists from developing countries, and those with low income," argue campaigners. "Such restrictions will damage the vital contribution made by global artists and scholars to cultural, intellectual and civic life in the UK." The Manifesto Club, which hopes to achive over 10,000 signatures to its petition, is urging people to not only sign it but also write to their MP in protest. "Tell them your concerns about the issue, and how it’s affecting artists, scholars and many other professions," they suggest. "If you have been personally/professionally affected give them a brief account of what happened and let them know that the points-based system could have a potentially detrimental effect on the UK’s arts and cultural sector, and it may affect local arts groups and festivals in their constituency." • If you have been (or will be) affected by these regulations, please complete the Manifesto Club campaign’s online survey. This will provide a rich source of material for them to better argue the case and gain more publicity for their campaign. With Father's Day just a month away - on 21st June 2009 - many people may be racking their brains to think of the perfect present. 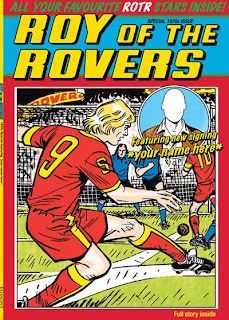 Well, publishers Egmont may have the solution - the chance for your Dad to feature alongside the legendary comics football hero Roy of the Rovers in his own comic strip, and be the star. Simply visit this dedicated page on the Egmont UK web site (www.egmont.co.uk/royoffer), pop in his name, pick a look, and your perfect gift should arrive in good time for Father's Day! With 17 name checks and 12 illustrated features, your Dad should feel really special as he reads about himself as a super striker saving the day for Melchester Rovers, but as an added incentive, Egmont are currently offering everyone the opportunity to purchase a unique Roy of the Rovers personalised book with a discount of 20% using the code U09-FDP -- and extending the 20% discount to all products bought from the Egmont website at the same time. That means you can continue shopping (using the 'continue shopping' button!) and buy more Egmont titles. 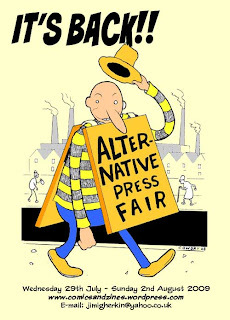 Comics creator Jimi Gherkin and the team behind the upcoming Alternative Press Festival in London (Wednesday 29th July – Sunday 2nd August 2009, click here for the latest events listing) have been in touch to say that everything's go for this summer's events. "The venues are all booked up, the Anthology is on its way and we are preparing for a wicked festival!" he tells us. "Right now, we're starting to book tables out," says Jimi. If small press publishers would like a table space to exhibit and sell their work then various size tables are available. "Regarding the zine making, the idea is to encourage visitors to take part and get involved, to help the process along we will have themes," Jimi continues. "These are just ideas so that people can get started more easily but so far one is "Strangers", where, maybe the idea that lots of people in the city don't know each other, the lack of communities or people who interest us that we don't know. "The other is "You and Me", a lighthearted look at relationships, meeting someone for the first time, or maybe your relationship with not a person but something else, an idea maybe? "These themes can be narrative or non narrative based." In the evening of the event the Resonance FM radio orchestra will be performing a piece written by Ed Baxter, the Director of Resonance FM. "This will be really special and will be performed by the orchestra as well as actors, and two teams of artists will be illustrating the performance live on overhead projectors." Jimi enthuses. "If you're interested in being considered to be on one of these teams then also, get in touch." Tom McNally's beautifully produced small press B&W anthology Semiotic Cohesion reaches issue 4 with a further selection of short strips all written by Tom himself or Sebastian Borckenhagan. If you don't know what semiotics are then you could try looking at the Wikipedia entry on them, but you may be none the wiser for reading it. 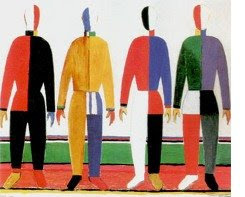 Some of the stories in Semiotic Cohesion may similarly leave you puzzled with as many appearing to come from an art school background as those coming from a more traditional comics background. While there is no true thread tying the stories together, the shark is very much the symbol of the title, be it the editorial from The Ancient Shark Of Despair to the Shark Of Wisdom which is illustrated by Brice Reignier and takes in such non-tradition shark locales as desert, mountains and the White House. From chocolate eating robots to demons discussing their female dates, Semiotic Cohesion is never going to be a tradition comic, but for me two strips stand out. Pegasus, written by Paul McNally, tells the story of a winged horse buying cigarettes for a girl and is drawn in a very early Seventies nursery comic style by Nandi Williams. Less traditional is Rhino, written by editor Tom McNally. This is silent strip telling the story of a tiny civilisation which takes over a rhinoceros turning it into a robot to roam the world, with lovely graphite-like pencils by Colleen Brice. Two very different strips, but both left me wanting more. Further details of Semiotic Cohesion titles and other merchandise for sale are available on the Semiotic Cohesion website. Tom McNally will be attending the London Underground Comics LUC 176 event in London on Saturday 27 June so go along and check out his work. Over on the downthetubes Forum we’ve started a discussion about promoting comics with a view to creating a “resource page” for creators looking for ways to publicise their work. Primarily, at the moment the page with edited info pulled from this discussion (view it here) is a list of links to sites and publications that run reviews but with hindsight it could also include ideas for promotion. British comics and genre magazine Tripwire has annouced they have added exciting new features to their already jam-packed 2009 Annual. 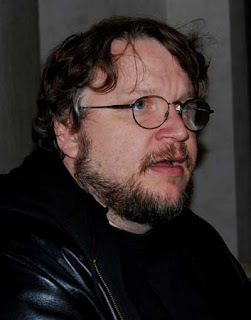 The magazine has landed an exclusive interview with award-winning genre master Guillermo Del Toro discussing his new novel The Strain as well as a few tidbits on Hellboy 3 and upcoming movie projects. The magazine has also attained an in-depth first look at Moon, the eagerly-awaited low budget British sci-fi movie starring Sam Rockwell and directed by Duncan Jones. "The addition of these two top notch features compliments what already promises to be the best Annual we've released to date," said Tripwire's Editor-in-chief Joel Meadows. "We've got such a big issue already. With our cover feature looking in-depth at Marvel Comics and its 70th anniversary, or the Alien 30th birthday retrospective later on, the Bongo Comics interview with Bill Morrison who's always entertaining, or even the Stripwire section with over 20 pages of original comics --it's just a real pleasure to be publishing this quality material. Adding these two new features strengthens the magazine further." On the topic of making a better magazine, Tripwire has performed a little reorganizing at the printer as well. Originally the magazine's 2009 publishing schedule included an Adventure Special for June, a Horror Special for Halloween and a Science Fiction Special for December. Instead the editors have taken some of the more timely content from the Adventure and Science Fiction Specials and folded it into the 2009 Tripwire Annual, making it bigger and better than they'd announced at solicitation. "We're committed to releasing the best magazine we can," offered Meadows, "and sometimes this means making adjustments on the fly." 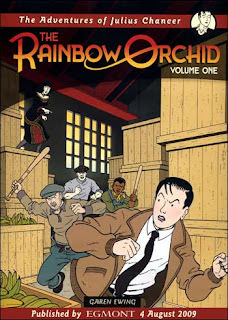 Features now included in the 2009 Annual are an exclusive Joe Kubert interview, a profile on publishers Flesk Publications with sidebars about artists Gary Gianni and Mark Schultz, a feature on 80 years of Tintin and a look at Dark Horse's Solomon Kane and other Robert E. Howard properties. "Our first focus is on the Annual, and making it as exceptional as its two predecessors. When we saw several articles from the June Adventure Special and the 2009 Annual beginning to converge, we knew we had to sacrifice the one to make the other even better," Meadows revealed. While the Annual has gotten larger than promised with the addition of the extra content, Tripwire still plans to do an Adventure Special later this year. "We're looking at releasing an improved line up for the Special around Christmas with a big Conan cover and features inside that cover everything from Howard's characters to a resurgence in the popularity of the pulps and many of the upcoming adventure movies and television shows for the next year or two." And the Science Fiction Special? "First Quarter of 2010, maybe," said Meadows with a laugh. "We're still planning Fantasy and Crime Specials for 2010 and now the schedule is tightened. There's so much we want to print, sometimes we have to make some painful choices." (Updated, 3 June 2009, see also "Mystery" 5 By 5 Festival: Details Emerge story): Web site ComicRelated reported earlier this week that Liam Fisher, the man behind the upcoming 5 by 5 Festival in East London which starts 18th June, had apparently secured the rights to do Comic-Con outside the US. However, downthtubes has since learnt that ComicCon has not sold any license for a UK show bearing their name in the UK. According to ComicRelated, the first event would take place next year in the 02 Centre in London and represent the first expansion of Comic-Con outside the US and a major growth in the convention scene for the UK. However, Shane Chebsey, co-organiser of the British International Comics Show, has now had two official denials of the report from the San Diego-based event. "I just received a second official notification from Comic Con in San Diego that they have not sold any license for a UK show bearing their name in the UK," Shane told downthetubes on 1st June. "They are now looking into the matter urgently." Mystery surrounds the origins of this report and, indeed, the distinct lack of PR - or even, it seems, a web site - for the upcoming 5 by 5 Festival being organised by Liam Fisher, especially given that the event "celebrates the ever changing world of pop culture and brings together the world of music, art, comics, films and fashion under one roof, regardless of genres or cliques." In fact, a quick web search for the festival turned up little more than this Newsarama thread, which reveals the festival will apparently include exclusive advance screenings of some of the biggest summer blockbusters such as Transformers: Revenge Of The Fallen and G.I. Joe, a variety of themed art exhibitions, live music, fashion shows, and celebrity signings and Q&As from the likes of Stan Lee, Alan Moore, the cast of Transformers, Kevin Smith, Christopher Nolan and Jamie Hewlett. Apparently the Festival is all free to the public. If anyone has more info or contact details for this event we're more than happy to give it more of a plug but given Alan Moore's avoidance of conventions for years and subsequent research with downthetubes contributors, we are beginning to wonder if the 5 x 5 Festival is a real event. downthetubes is aware that several major commercial companies have looked at putting on a large-scale comics-oriented event in the UK - some have even approached us for advice and contacts. A French ComicCon will also take place this July in Paris, with a license bought from the US to use the name. But, as yet, we'd argue only the MCM Expo seems to have begun to challenge the more popular, grassroots organised events such as the Comic Expo in Bristol and Birmingham's British International Comic Show.